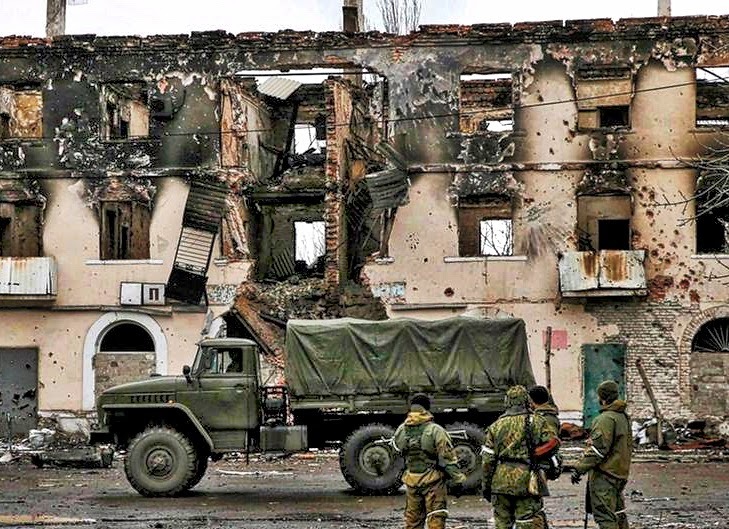 BERLIN, Germany -- Evidence is mounting that Russian soldiers are officially fighting in eastern Ukraine. Pro-Russian separatists in Ukraine are well equipped. Reporters and human rights activists describe their attempts to remain undercover. It was a surprising confession. That contracted Russian soldiers are fighting alongside the separatists in Eastern Ukraine against the Ukrainian army. And not just a few soldiers. A day after the interview was published, US General Ben Hodges said in Berlin that the US military was working on the assumption of 12,000 Russian troops in the region. It's not the first time such reports have surfaced. On Feb. 19, the Russian newspaper Kommersant published a surprisingly frank feature about the deployment of Russian soldiers in Eastern Ukraine. The article appeared in the online version of the paper, which belongs to oligarch Alisher Usmanov, known to be loyal to the Kremlin. Reporter Ilja Barabanov recounts how he met three Russians who had until recently been professional soldiers. In the second half of January, they went to Eastern Ukraine to fight. The men said they had fought since Jan. 20 on the front in various units of the separatist army of the "People's Republic of Donetsk." Before they left, they applied to end their army contracts and be officially discharged. Whether or not they were actually discharged, and what their current status is, is unknown. The three men said that their "indefinite business trip," as it was called by the Kommersant reporter, was approved by Russian officers. Later, in an interview with the Russian broadcaster, Business FM, Barabanov said he'd had the impression that the young men had gone to fight in the war "of their own free will." In his article, the journalist described the tactics used by the professional Russian fighters in Donbass. They fight on the foremost front, but are constantly making sure that they fly under the radar of journalists and other observers. "When it's time to do battle, only those who are really there to fight leave the base. They get the job done and come back. In the towns they've occupied, the members of the local citizen's army (term used by the separatists to describe themselves) gather round, and the men then like to portray themselves as former miners," Barabanov writes. It's all meant to give the impression that only local residents are fighting on the side of the rebels, and no one else. Russian President Vladimir Putin gives a similar account of the situation. "It's always a bad thing to lose, especially when you're losing against former miners and tractor drivers." In an interview with DW, Dmitri Pyslar of the Association of Russian Soldiers' Mothers said that Russian troops are fighting in Eastern Ukraine, and that they were part of the attack on Debaltseve, even after the ceasefire was agreed. But since such pains are taken to keep everything secret, it is hard to get exact information. Pyslar said it is impossible to say how many soldiers are participating in such operations. "We tried and we failed. One goes, and another comes. It's not as if troops are sitting there (in Ukraine) over a long period of time," he said. However, he doesn't buy the message being spread in Russia that soldiers are merely "vacationing" on the front in Donbass, or fighting voluntarily without a valid contract from the Russian army. Valentina Melnikova from the Association of Russian Soldiers' Mothers talks to lots of soldiers but has never heard any confirmation of this official version of events. "No one said anything like that to us," she told DW. Rather, soldiers she spoke to said they were promised "some type of reward" ­– such as an honor, or a veteran's ID. Often, these promises are not kept. "They complain to us that they don't want to go back to Ukraine a second time because they didn't get what they were promised," she said. In Russia, it is only legal for the state to send military personnel to work abroad if the person is a professional soldier on a contract, and if they have expressly agreed to a foreign deployment. There are many cases of soldiers who have refused, said Melnikova. "The Russian military court opens proceedings for desertion in that case," she said. The same thing happens to Russian soldiers who are taken prisoner in Ukraine. With her help, the New York Times documented one such case. An orphan by the name of Petr Khokhlov signed a limited contract in 2014 with the Russian army. One day, he disappeared from his base, without saying a word to either his fiancee or his brother. Some time later, he surfaced again on a video made by Ukrainian authorities as a prisoner of war. Later, his brother learned that Petr had been exchanged for Ukrainian soldiers and had been handed to the separatists. But the Russian army representative didn't want to know about it. Officially, Khokhlov was a deserter. His trail went cold again until months later, a New York Times reporter found Khokhlov at a separatist checkpoint in Eastern Ukraine. He told the reporter that he was there voluntarily. The government in Moscow insists that there are "no regular Russian troops" in Ukraine. No Russian army formations have been spotted in Eastern Ukraine. At the end of August last year, though, a large group of Russian soldiers was seen in Ukraine, but Russian authorities explained that they had gotten lost and had crossed over the border without realizing where they were. That's the Kremlin's official position. However, Russian politicians are more frequently referring to "volunteer" fighters with military backgrounds who've gone to Donbass on their own accord. "Anyone who has left the army or who is on vacation can go where they want," said Russian parliamentarian, Viktor Savarsin. "It's a fact that there are officers and soldiers who have gone there and who have participated in battles, and we are not hiding this fact."